Low maintenance landscaping around the pool means more time having fun IN the swimming pool. When landscaping swimming pools, owners (like us) are looking for plants that serve a purpose - like privacy - and are easy to maintain. The purple hydrangeas come back every year providing us with beautiful bouquets of flowers. They never get any kind of disease and I rarely even fertilize them - truly low maintenance. Be sure to trim them back right after they bloom so that you'll get blossoms the following year. 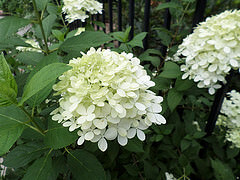 A later blooming hydrangea - in mid-July - the PeeGee Limelight provides large, lime white blossoms that dry with tinges of pink. I don't even fertilize mine and don't water them like I should. But they still forgive me and and give forth blossoms that are picture perfect. 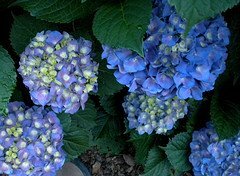 Unlike my Nikko blue hydrangeas, these blossom on new growth so you can prune them in early spring. I love these hydrangeas and so do the deer. The ones inside the pool fence are protected - but those outside the fence get a good dose of Deer Scram granules. Spread the granules around the base of your deer loving plants. 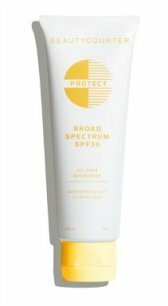 This product worked for me and we have deer coming into our yard all the time. Anything that blossoms around our pool is a perennial. 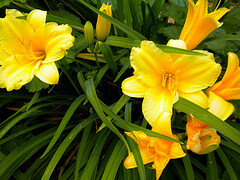 These Stella d'ora day lilies blossom in the early summer. Even though you will read that they blossom several times, we have not experienced that. 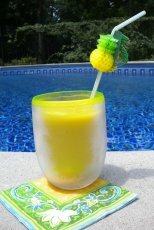 But we do love the splashes of yellow and have them in several places around the swimming pool. One of my favorite bushes is this pink blossomed spirea. 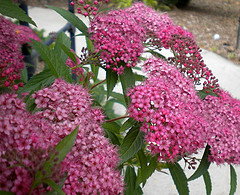 It adds great color to your landscaping and blossoms several times over the summer. It needs trimming maybe once or twice a year. I also like that it doesn't grow out of control which makes it easy to maintain. 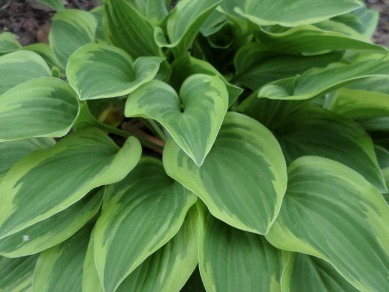 Plant shade loving Hosta underneath trees or places that get some shade. Our hosta do get some sun. There are so many varieties of this plant - some small and some large ones. We have one variety that is huge and loves the sun. Use lots of mulch landscaping the perimeter of your pool. It means less watering and better yet, less weeds. Normally, we replace our mulch about every two years. About 2"- 3" of mulch will help keep your plants from drying out and weeds from coming up. Taking down several trees around the pool means lots more sunshine which we like, but so do the weeds. I was surprised by how many more weeds started popping up around the perimeter of the pool with more sun. One of the best things we did was to lay down commercial grade weed control fabric around the bushes and plants before we placed the fresh mulch. One of the fabrics we bought from a hardware store said it was suppose to last 30 years! I'll probably never know if that's true, but I do know that it lets air and water get to the roots but doesn't let the weeds come up. We do alot less spraying for weeds. The two fabrics we've used are Easy Gardener and Landmaster. They come in different lengths - 50' and 100' but most are 4' wide. We've had these fabrics down for a couple of years and they really help to control the weeds. Less time pulling weeds and more time in the pool. I have used this hose for 3 years now and it's the only hose that hasn't needed annual replacing. What I like is that it is lightweight, not nearly as heavy as other hoses. It is very flexible which means it doesn't kink as much as other hoses and when it does, a quick snap of the wrist and I can often unkink it. It's a nylon hose that is phthalate, BPA and lead free and make of chrome plated zinc fittings - which means no leaking at the faucet. The picture shows a purple hose - but you can get it in a nice mossy green - which is the one I purchased. We got tired of the messy pine needles. As soon as we had the pool area all blown, the pine needles would drop so fast and thick that by the next day, the mess was back. So this fall we decided to take down the remaining pine trees that surrounded the pool area even though it meant that we would lose some shade. 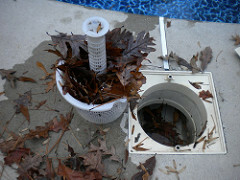 Fewer trees means not only less leaves and pine needles on the pool deck but in the baskets and pool cleaner as well. Some days we would have to empty the baskets twice a day and the pool cleaner at least once a day. During the fall, the leaves and needles would need to be scooped out with the pool leaf net daily. When we were first building our pool our landscaper recommended that we remove more trees, but we resisted. Well, we should have listened. The trees, although they provided nice shade on hot days, they prevented our pool water from heating up. 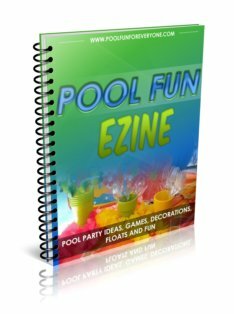 They were dropping pine needles, leaves, sugar gums and all other kinds of stuff it seemed year round always making a mess of our pool deck. This summer we are looking forward to less maintenance of the landscaping. Each year we try to replace plants that are too high maintenance - plants that are prone to disease, need lots of watering or fertilizing. However, the biggest help has been taking down trees around the pool area. So if your landscape designer suggests that you take down more trees when you put in your pool, listen to him.